MOTORHEAD - MOTORHEAD REMASTERED (CD) | Online Shop | Wizard LTD.
Motorhead is the self-titled debut album by the British heavy metal band Motorhead, released in 1977. On 1 April 1977, after nearly two years of toiling in obscurity hoping for a record deal, Motorhead decided to perform their last show at the Marquee Club in London. They asked Ted Carroll, head of Chiswick Records, to record the show for posterity. Instead of recording it, he offered a chance for the band to record a single. This being their last chance, they recorded 13 backing tracks in just two days, impressing Carroll enough for him to offer them further studio time to complete the tracks. Eight of these tracks were released on this eponymous debut album. The album did well enough to ensure the band would remain together, but it would be their next album, 1979&apos;s Overkill, that proved to be their true breakthrough. The band had earlier recorded their debut album On Parole for United Artists Records, but the record company was stalling on its release, unsure of its commercial viability. For this album, the band chose to re-record that album in almost its entirety, only "Fools" and "Leaving Here" weren&apos;t re-recorded at these sessions. In addition two new self-penned compositions were added in "White Line Fever" and "Keep Us on the Road." as well as a cover of "Train Kept A-Rollin&apos;." 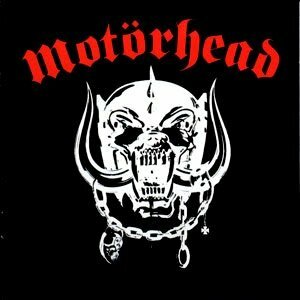 The title track "Motorhead" was coupled with the non-album track "City Kids" for release as 7" and 12" singles. The four remaining tracks from the session were shelved until 1980, when they were released on the Beer Drinkers and Hell Raisers EP. The B-side and the EP were later added as bonus tracks to the CD release. The sleeve artwork featured War-Pig, the fanged face that would become an icon of the band, created by artist Joe Petagno. The inner sleeve featured old and new photographs of the band and friends, plus letters of thanks from Lemmy, Eddie and Phil. Advertisements for the album, single, and tour bore the words "Achtung! This Band Takes No Prisoners."